MEAT! A friend of mine became a vegetarian as a child simply because he wanted his sister's "Meat is Murder" badge. 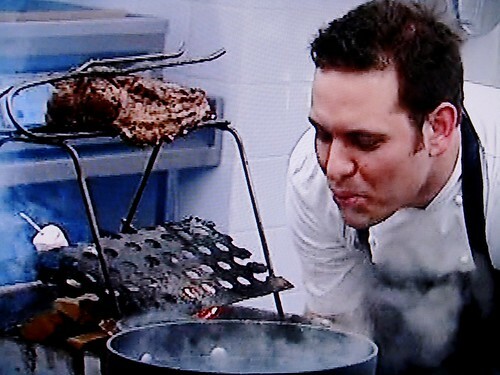 Such folly would never sway me from the pleasures of the flesh, and thus today's episode of the Great British Menu 2009 was a real treat for me. Four of our eight brave contenders have picked lamb to impress the judging panel of Prue Leith, Oliver Peyton and Matthew Fort, and all except Kenny Atkinson have tweaked or completely overhauled their dishes. Yummy Brummie Glynn Purnell has ditched the faggots and gone for Pork with Vanilla Dipped Potatoes, Jerusalem Artichokes, Black Pudding Crumble and Glazed Pears - no surprise that Tristan Welch asks if he's making a pudding (incidentally, Dos Hermanos says them vanilla potatoes "work better than anything that sounds so ghastly has any right to"). Oliver Peyton says of the dish "The individual parts are all endearing, but they're not all in one building" (how I love daft metaphors). Matthew Fort goes one better, saying that Glynn has gone from "the suburbia of faggots to a chateau with turrets ... but it's more of a sketch than a masterpiece". They all agree that it's a wonderful idea but not a very successful realisation ("It's like he's experimenting on us" says Oliver). 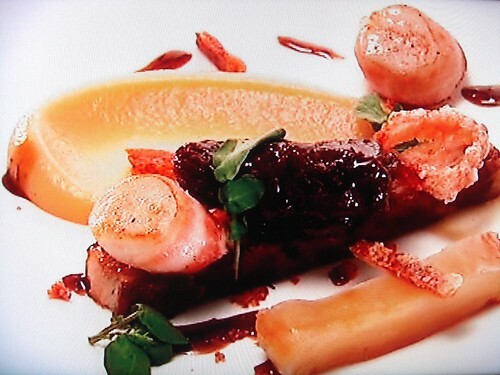 Moving on to Danny Millar with a new dish and the one he hopes will see him at the banquet. He's making Roast Rib of Dexter Beef, Potato Boxty, Summer Vegetables and Gravy. The boxty is potato mixed with lashing of cabbage and bacon - a little like bubble & squeak - and the resulting fat cakes are seared. The beef itself is served whole on a great wooden platter, to be brought out on a trolley and carved at the table with aplomb (Kenny and Glynn's take on this is at the top of this post). All the judges exclaim at the drama and joy as Matthew carves great slabs of juicy, bloody beef onto each plate. 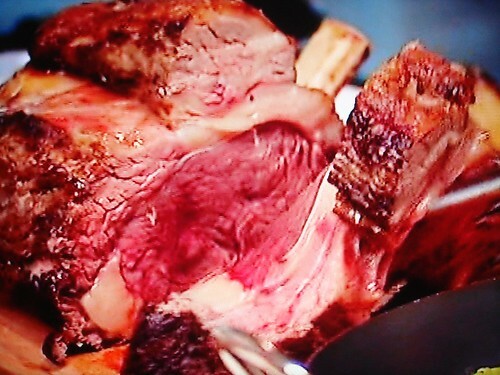 Prue declares "It's a feast fit for heroes"; Matthew says it's "the finest piece of meat ever with sensational juices"; Oliver calls it "a complete showstopper". They wonder if it lacks culinary skill/gastronomy, but Matthew simply sighs "It makes me happy". Shaun Rankin is serving up his strongest course - Belly and Cheek of Pork with Apples, Scallops, Watercress and Minted Potatoes. The smoke and noise of Tristan Welch's dish unnerves him however, and like James Sommerin the day before, he forgets an ingredient - the watercress. Prue is grateful when he eventually remembers it as it "cuts through the stickiness". Matthew is damning - he says it reminds him of his school report - "Tries hard, could do better". Oliver declares it "too complicated; not focused; too appley". As mentioned earlier, Tristan Welch meanwhile has been smoking the hell out of his Spit-Roasted Best End of Lamb with Peas and Mint Sauce. 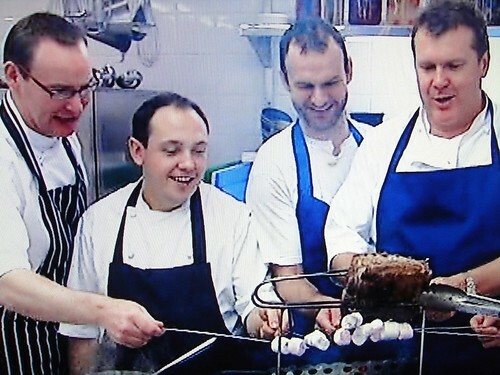 It's so fiery that the other chefs decide to roast some marshmallows. 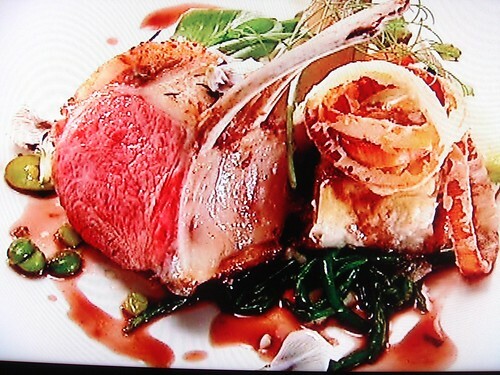 Tristan's changed the breed of lamb which Matthew says has "big boingy flavour" and added more crackling, including the "lamb lollipops" that Prue adores. No-one can detect any smokey flavour though, and Oliver says that, unless the soldiers can see the lamb being spit-roasted before them, they won't be impressed. Matthew complains that "this is the dish of a diligent schoolboy who follows lessons without injecting imagination". Or smoke. 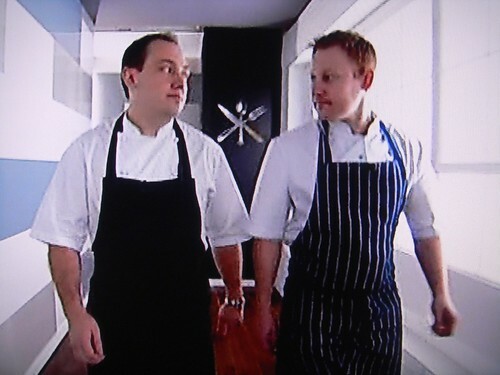 The next two chefs are Kenny Atkinson and James Sommerin who fight over which end of the kitchen to use. The territorial war prompts Glynn Purnell to comment "It's Mini Chef Wrestling!" 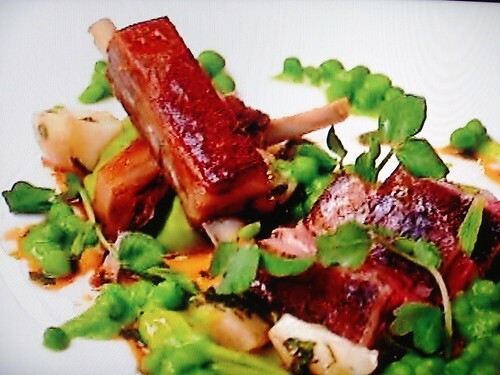 Kenny Atkinson is making Northumberland Blackface Lamb, Asparagus, Baby Leeks and Pease Pudding. 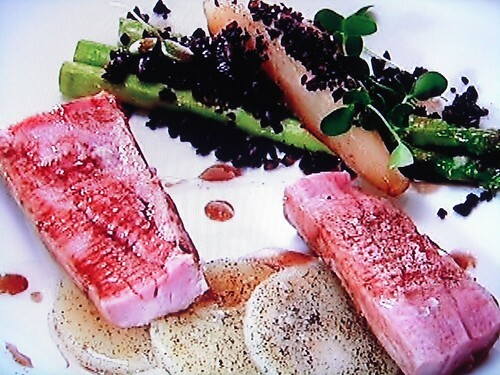 Unbilled, he's also adding confit cherry vine tomatoes, morel mushrooms and pea and mint puree. Prue says it's all perfectly cooked and really loves it, but Oliver says it lacks soul, "If this dish was my girlfriend, I'd take it home to my mother because it's polite and lovely but not amazing". Interesting lovelife you got there, Peyton. Matthew settles for "it lacks fireworks". James Sommerin has abandoned rabbit for his meat course, and is now dishing up Rack of Lamb with Apricot and Thyme Sausage Roll. He also adds the tiniest, stingiest smear of mash imagineable, summer veg and, for Welsh flavour, onion rings (but with leeks). Too late, he realises the pastry for the sausage roll is undercooked and soggy. This dish wins no friends. Oliver really doesn't like the sausage roll and says it's "just lamb and stuff", Prue says it's "positively nasty", with undercooked pastry, sauce too winey and samphire "devoid of flavour until you swallow when it's horribly bitter". The best comment is Matthew saying it looks like Wales - all hills and valleys - rather like James's cooking in this competition. 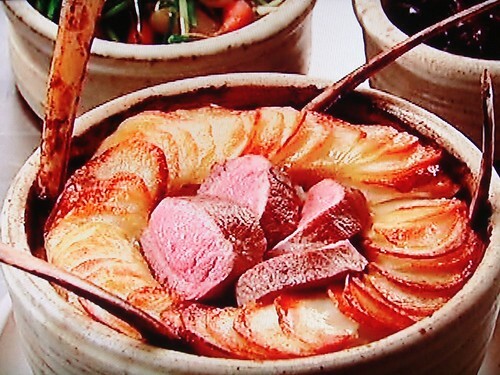 Nigel Haworth is up next with his Lonk Lamb Lancashire Hotpot, Pickled Red Cabbage, Carrots and Leeks. 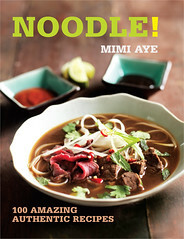 His tweak is adding slices of pan-fried loin of lamb to the hotpot, rather like a silly hat. When the hotpot arrives, Matthew Fort actually squeals with joy. Oliver Peyton says while the loin of lamb is distracting but delicious, the dish itself could not be more perfect and it's a complete winner. Prue says all her reservations melted on tasting the dish as this is "cooked with love, just perfect and everything we've been looking for". 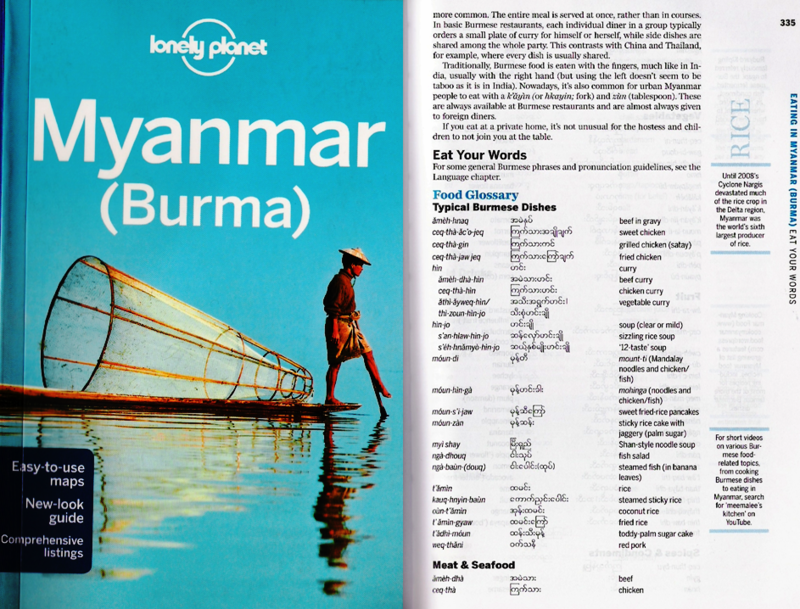 it's got heart, it's got home, it's got warmth, it's got welcome, it's got love, it's got a perfect score of ten". 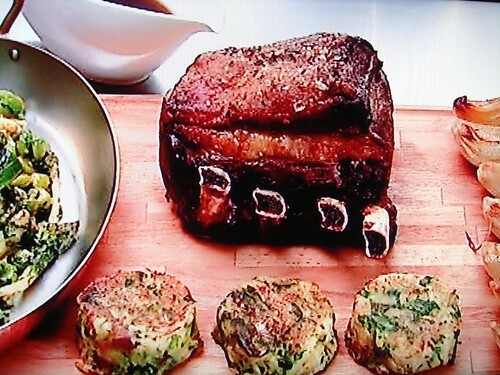 How can our last contestant Tom Kitchin beat this? 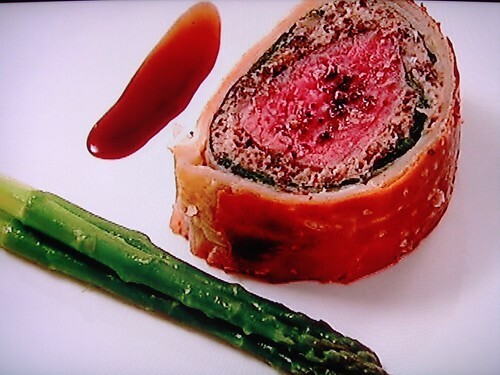 He has a bloody good try with his Beef Wellington, Morel Mushrooms and Asparagus. He wraps the beef in caul fat, pancetta, spinach, morels and chicken mousse, then chills in a layer of clingfilm (wot, no pancake?). Finally he removes the clingfilm, rewraps in pastry and bakes. The Wellington emerges golden and beautiful and he serves simply with asparagus and "a little rich beef shoe" (sic Jennie Bond). Personally, I think the plates look a little stark but apparently Tom is being clever as the Wellington speaks for itself without extra garnish. Oliver says it's "the best Wellington I've ever had; an absolute triumph" and it "screams of prowess, skill, care and love. Although Beef Wellington is a typical Officers' Mess banquet dish, Prue thinks it will still impress the soldiers as they'll realise how much better it is than what they usually get. Matthew calls it a "mothership of a dish". So finally the judges tot up their scores and this is how they place the chefs for today's Meat round. 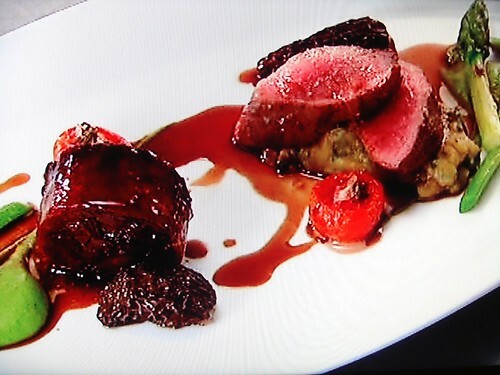 Nigel's Lonk Lamb Lancashire Hotpot for the win (say it quickly three times), though I reckon Tom would have won on any other day (my Digitalspy buds have pointed out that though Danny's dish was fab, it kinda resembles Jason Atherton's winning meat course from last year). Stay tuned for the final and prettiest round - Dessert!